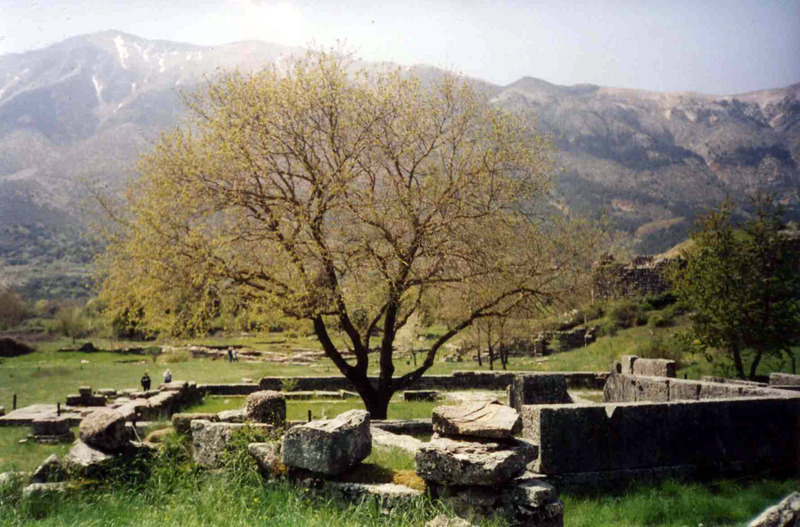 Dodona is one of the oldest oracles in Greece, located near Yannina, Greece. I was born in a small village, Anatoli (which means East) about 5 kms from Dodona. A picture I took when I visited Dodona – the oldest oracle in Greece. It is here that Zeus speaks through the rustling of oak leaves and doves (pigeons) fly across the sky leaving message trails that punctuate Zeus’ rustling words. The word dodona in my web address is thus connected with my place of birth and its oracular history, since my interests are mantic in nature and this blog expresses some of them. By the way – I did not consider all the many meanings and symbolism of 777 when I used the number in my email and blog address….but it does make interesting reading – one wonders whether 111, 222, 333, 444, 555, 888, 999 would also come up with as many meanings :). “This number joins together the principles of the man, 700, the cosmic plans, 70, andtheir image in the Archetype, 7, according to R. Allendy. It is the universal organization, 7 + 7 + 7 = 21, the general evolution. Represent the celestial perfection, 7, on the 3 plans of the manifestation: matter, astral (mental or soul) and spirit. It is the number of the sacred work of the sons of God for the establishment of the Kingdom of God on the Earth, mainly for the period of the seventh millennium after Adam where it is written that Satan will be chained for thousand years. In esotericism, 777 means that virgin spirits (those to which God gave the life with the mission to rise towards the Creator, until to absorb themselves again in Him) will know 777 incarnations during seven revolutions that the wave of life accomplishes around the seven globes of the seven world periods. The symbolism of this number is therefore the ascension of the soul through the physical body. According to the tradition of Himalayan masters, 777 is the number of the celestial man and symbolizes the transmutation which takes place at the time where the man becomes conscious of the necessity to cover the path of initiation, and that he perceives, even of an elementary manner, that the goal is in God. The purity – does not father and is not fathered. Bible Age of Lamech, father of Noah, when he died. In the posterity of Seth, Lamech is the last patriarch before the flood. (Gn 5,31) The book of the Genesis contains 777+777-21 or 1553 verses. General question, in the Secret Doctrine of H.-P. Blavatsky, to solve “the problem of the 777 incarnations”. If seven is the number of cycles and of the divine numbers, in it resides also the secret of the 777 incarnations of the man that should be taken care to not interpret as being the totality of incarnations of the man on earth, but that it should rather be reported to what the humanity must one day realize. In a study on this number, H.S. Green sees there the triple evolution of Manas, Buddhi and Atma – “The number 777”, in “The Theosophist”, London, n. 9, 1909, p. 326. Raoul Auclair points out that when the Virgin Mary appears in Cova da Iria in Portugal, on August 13, 1385, this country was then 777 years old. And 532 years later, that is to say on May 13, 1917, took place the first appearance of Fatima. In an Ethiopian apocryphal book, named “The Wisdom of Sibyl”, it is written in conclusion of the book: “End the prophecy of the Sibyl. Praise to the Lord, Master of the world. Amen! That the Lord, eternally, makes you mercy. The Sibyl saw nine suns; each space of time is 778 years; the ninth is 777. The cycles of the Sibyl are 800 or 700; each is 800 years. There are 49 cycles of Ezra; each one counts 143 years. The cycles of Enoch are 10 and each cycle is 700 years. The Days of the Lord are 7; for us there are 2548000 days.” By making the calculation, this cycle of the nine suns lasts 7001 years: 8 cycles of 778 years = 6224 years 1 cycle of 777 years = 777 years Total = 7001 years And the 2548000 days of the Sibyl have a duration of 7000 years minus 7000 days. The document “the celestial sanctum” in the order the Rosicrucian A.M.O.R.C., titles also the “liber 777”. Gematria The Christ said: “I am the resurrection”. In Greek, resurrection is written “h anastasiV”, numbering 777 = 8+1+50+1+200+300+1+200+10+6. In the first verse of the Bible, it is written: “In the beginning God created the heavens and the earth.” (Gn 1,1) This verse consists of 7 Hebrew words and 28 letters, and it also counts three names: God, heavens and earth. The sum of the numerical values of each one gives 777: God = 86, paradise = 395 and earth = 296, where 86+395+296 = 777. Written in Hebrew, “Orthodox Messiah”, gives 777: he, mem, shin, yod, heth, daleth, taw and yod, giving 5+40+300+10+8+4+400+10 = 777. Written in Hebrew, “YHWH in the YESHUA Messiah”, gives 777: yod, he, waw, he, beth, yod, shin, waw, ayin, he, mem, shin, yod and heth, giving 10+5+6+5+2+10+300+6+70+5+40+300+10+8 = 777. Written in Hebrew, “YESHUA saves”, gives 777: yod, shin, waw, ayin, he, waw, shin, yod and ayin, giving 10+300+6+70+5+6+300+10+70 = 777. By using the ASCII table, we find that the French word “EXORCISTES” (exorcists) gives 777. The numerical value of the Hebrew word NMLA IVMM, meaning “filled with light”, gives 777. You are currently browsing the archives for the Dodona category.